If you’ve been following me for a while, you already know that two of my granddaughters, Miss M and Miss K, stay with me during the day while my daughter is as work. And they are always hungry. Always. I would love it if they only craved fresh veggies or fresh fruit all of the time, but that just isn’t the case. So I’m always on the lookout for other healthy snacks that they will actually eat. 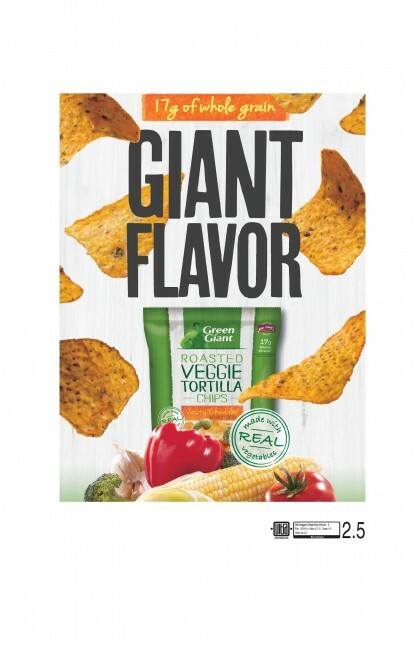 Enter Green Giant’s new Veggie Snacks. When Green Giant offered to send us some to try, I thought they might just be worth checking out. They’re made with real vegetables, whole grain and have zero trans fat. Sounds worth a try to me! First up was Miss M. Green Giant sent me two flavors of chips – Sweet Potato Barbecue Chips and Roasted Tortilla Garden Ranch Chips. 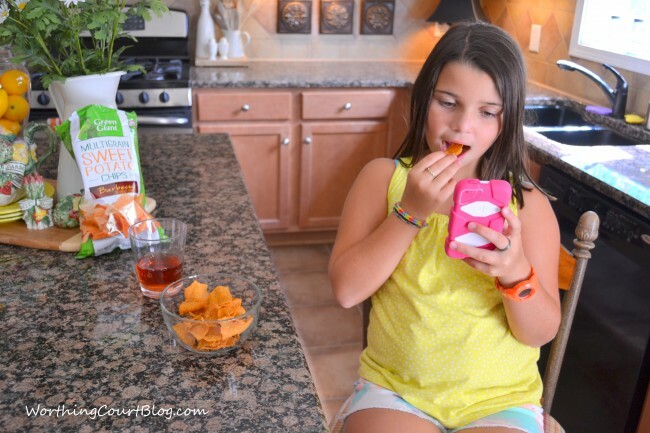 Miss M decided that she wanted to sample the Sweet Potato Barbecue Chips. Typical pre-teen. Too busy on her ipod to pay much attention to what I was doing. ☺ Her verdict was, and I quote, “The flavor is really good, but the texture is different from any other chip I’ve ever had.” After trying them myself, I have to agree with her. Really good barbecue flavor, but the texture is definitely different than what I’m used to. 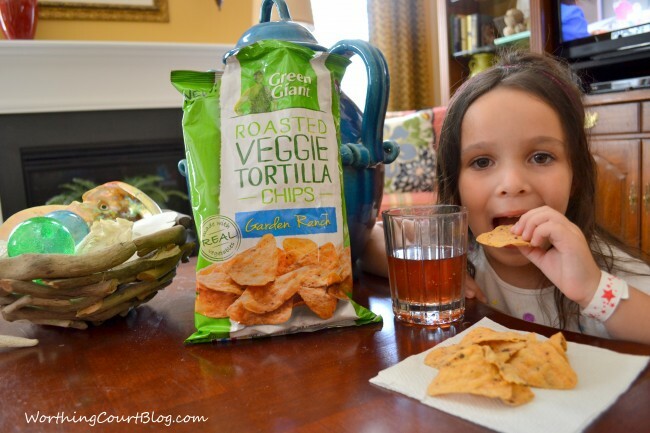 Next up – Miss K and the Garden Ranch Roasted Veggie Tortilla Chips. I think I’ll try using the Garden Ranch Tortilla Chips in place of regular ole tortilla chips the next time that I make a taco casserole. I think they’d be great crumbled up on the top. And when these two hungry kiddos come in the door from school, I plan to have some of these around. I wouldn’t mind them grabbing these at all.